The Russia’s biggest instant-payment operator announced that its shareholders were seeking to list 12 million shares on the NASDAQ in May. Qiwi may be able to attract up to $250 million during its IPO. Qiwi PLC, owner of Russia’s biggest instant-payment operator, announced that its shareholders were seeking to list 12 million Class B shares (U.S. $16–18 each) in the form of American depositary shares (ADS) on the NASDAQ in May. Overall, the company owns 52 million shares, so the placement of 12 million Class B shares accounts for the free-float of 23 percent in Qiwi’s authorized capital and 2.9 percent of the voting interest. In case there is high demand, the underwriters — Credit Suisse, JPMorgan, Renaissance Capital, Robert W Baird & Co. and William Blair & Company — are entitled to purchase an additional 1.8 million shares from the holders and place them on the stock exchange within 30 days of the IPO. In this case, the company’s outstanding share capital will constitute 26.5 percent, and the holders of these securities will collectively have 3.35 percent of the voting power at Qiwi’s shareholder meetings. Antana International Corporation and Mail.ru Group will be the primary sellers of Qiwi’s equity, with the former expected to trade 3.23 million of shares for $51.7–58.1 million, and the latter putting up 3.01 million shares worth $48.2–54.3 million. With 24.5 percent of shares in the company, Qiwi PLC CEO Sergey Solonin also serves as its biggest co-owner. He does not intend to sell his part of the equity, as his voting interest will reach 33.3 percent, in case the underwriters opt for the buyout and the sale of additional shares. By setting the share price at $16–18, Qiwi has estimated its worth at $832–936 million, which corresponds to 30.8–34.7 percent of its 2012 net revenues or 2.8–3.2 percent of the company’s overall earnings for the same year. Otkritie Capital analyst Alexander Vengranovich. For example, when the payment system Yandex. Money was purchased by Sberbank a few months ago, its business value was 4.7 times higher than its revenues for the previous year; with eBay (which now owns PayPal), it was 25 times higher. Freedom Finance CEO Timur Turlov agrees with Vengranovich. “The shareholders have chosen the right time for an IPO. The company is performing at its best and the business is going strong. Higher-level payment systems, such as Visa and PayPal — which is now part of eBay — are currently trading their shares at a very high P/E [market price per share divided by annual earnings per share] ratio. That is why Qiwi has the potential to become an important NASDAQ ‘chip,’ despite its small size,” Turlov says. On the down side, Qiwi’s business may be too risky in the long term, as the company competes with plastic card issuers and virtual currencies used on the Internet that will sooner or later overtake POS terminals. Vengranovich points out that Japan’s Mitsui estimated Qiwi at $644 million during their last equity transaction. The IPO is going to be modest, with only $192–216 million expected to be raised. Yet, it may be marred by the fact that the shares will be sold by Qiwi’s shareholders exclusively, whereas the company does not plan to attract any funds itself, according to the Otkritie Capital analyst. At the same time, Qiwi has many private co-owners, and it is unclear what they are going to do once the ban on deals with the company’s shares has been lifted. Vengranovich argues they may want to continue selling them. 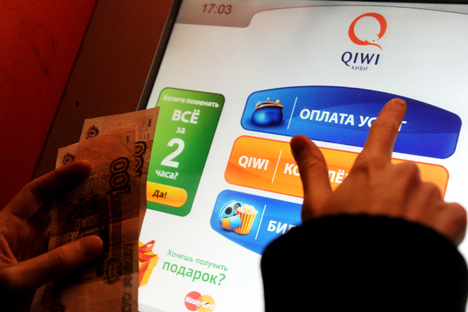 Qiwi is the biggest instant-payment system in Russia. According company data, it operates more than 11 million digital wallets, as well as 169,000 kiosks and terminals. Over 40,000 retailers use the system to process more than 39 billion rubles ($1.2 billion) in cash received from 65 million customers each month. Company revenues for Qiwi increased from 8.15 billion rubles ($255 million) in 2011 to 8.9 billion rubles ($280 million) in 2012, and the adjusted net revenue without agent commissions went up from 721 million ($22.7 million) to 1.3 billion rubles ($41.7 million) in the same period. Adjusted EBITDA amounted to 1.85 billion rubles ($58.5 million). Qiwi’s largest co-owners include its executives and founders, who jointly own 59.6 percent in the company when their options are added to the equation. More specifically, the company’s CEO, Sergey Solonin, owns 25.4 percent (he is the largest shareholder); Antana International, an entity controlled by Qiwi board chairman Andrei Romanenko and Nikolai Romanenko, owns 12.7 percent; Igor Mikhailov’s Dargle International holds 4.4 percent of the shares; Boris Kim, Gennady Babkin and Aleksei Korepanov control the 8.4 percent belonging to E1 Ltd.; Sergei Fedyushenko’s Bralvo Limited holds 4.4 percent; Andrei Muravyov owns 8.5 percent via Palmway Holding; Mail.ru Group possesses 21.35 percent; and Japan’s Mitsui & Co controls 14.9 percent of the shares. This article is based on materials from Kommersant and Vedomosti.